The wait station is coming along, today it saw its first coat of (real) paint. 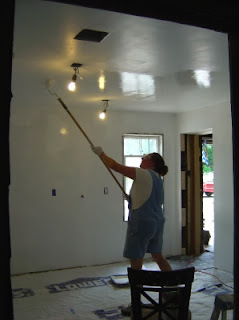 Tomorrow there'll be a second coat and then it's trim work, floor work, (and a few other little things I can't think of right now), and then we'll move a lot of furniture and equipment into its final resting place. 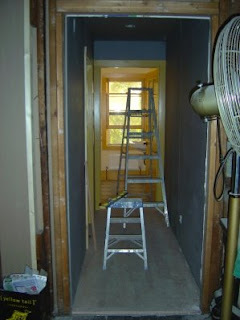 In case you wondered what I have been up to lately (not that you would, and I really only write this to fulfill my obligations as the secretary of the company - or was I the treasurer) I have started getting the little hallway to the bathrooms ready for plastering. Aside from that I have been bogged down by the lemons life throws you, like a broken lawn mower, a broken lawn tractor, a flat on the truck. Life was never meant to be easy, but nobody said it's supposed to be a thrill ride. Oh well, lemonade anyone?